Kristan Higgins stops by SheKnows to discuss her latest book The Best Man, her inspiration for her strong female characters, and where she fits in the chick lit/women’s fiction/romance genre divide. SheKnows: Your latest book, The Best Man, is about a woman, Faith Holland, who lost the guy she thought was her one and only. Can you tell us why you chose that title for the book? 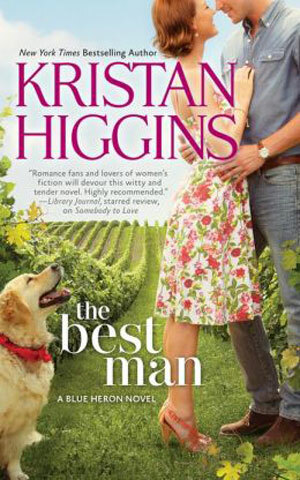 Kristan Higgins: Well, it’s a double (maybe triple) entendre title. Jeremy, who jilts Faith at the altar in the first four pages of the book, really does seem like the best man in the world. But it’s their best man who gives Jeremy the nudge to break things off with Faith (and talk about the last possible minute, right?). Faith channels a lot of her anger over this incident into Levi. Finally, Faith has to ask herself what qualities a guy will have to embody to be the best man for her. He’s usually a lot different from what our heroine might initially want, but he’s always the person she absolutely needs. SK: You only recently started writing from the man’s point of view. What made you decide to include portions of the story from Levi’s point of view in The Best Man? KH: I do love writing in first person; it’s such an intimate style, and we authors can have a lot of fun playing with what the point-of-view character thinks to be true, as opposed to what actually might be true. That being said, I’ve also really enjoyed writing the male point of view. Honestly, it depends on the book. For The Best Man, I wanted to include Levi’s side of things because his relationship with his friend is so revealing about who Levi really is — in a lot of ways, the book is a bromance as well as a romance. Because Faith is from a wine-making family and has lived a pretty comfortable life, I also wanted to give a grittier take on life in a small rural town, so Levi served that purpose, too. I love how gruff he appears to so many people, and what a softy he really is, as shown in his interactions with his sister and some of the townspeople. I have a huge crush on this guy. SK: You’ve written many books with feisty, quirky, strong female characters. Where does your inspiration for these great women come from? Did Faith come from somewhere in particular? KH: I don’t know that these women come from one source of inspiration in particular as much as a blend of the qualities I admire. My heroines are always clear about what they want; they’re hardworking and loyal, and funny. Faith was in some ways one of the more vulnerable characters I’ve written because she carries a heavy burden from the past and feels responsible for her mom’s death. To keep her from being too pathetic, I wanted her to show her strength in other areas: her unapologetic love of her family, the way she takes no nonsense from Levi, and her enduring love for Jeremy. She was able to create a happy life after being publicly heartbroken, and she’s not afraid of change. Bits of her come from a few of the women I love most: my sister, who’s such a kind and funny person; my mom, who never takes herself too seriously and always seems to get into trouble one way or another; and probably from me, too, in that I feel responsible for (and guilty over) just about everything. SK: Genre labels seem to be more and more important in writing. Do you consider your novels romance, women’s fiction, chick lit, or does genre not matter to you? KH: I write the kind of book I love to read, and while I recognize the fact that I’m walking the line between women’s fiction and romance, I don’t think it really matters. I suppose it matters to the publisher and the bookbuyer, but readers just love what they love. SK: Can you tell us what books are on your nightstand right now? What should we be reading? KH: I’m reading The Weight of Silence by Heather Gudenkauf, and it’s extraordinary and gripping. I just finished Elinor Lipman’s The View from Penthouse B, and I loved it so much, I read it twice. Thanks so much for having me today, and thanks for the wonderful questions!